Those of you who will not be able to make it to the world premiere at the Festival Interntaional du Insulaire du Isle de Groix on Friday 22nd August 15:30h can catch the next screening of our documentary in Athens! It has been 4 years since Lindsay Goodall and I embarked on the journey of producing this film together and many amazing people have since joined us. In December 2010, we first pitched the idea for the film at the very spot where it will now screen: at the Storydoc workshop at Goethe Athens. Very happy to bring the finished film back to this screen now! Come and celebrate this homecoming with us! Next screening dates for THE ISLAND BUS announced! 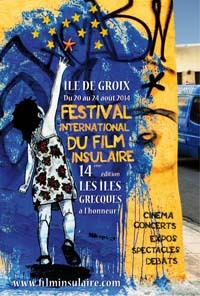 The 14th Festival International du Film Insulaire de Groix focusses this year on the Greek islands and we are very proud to be part of a screening session on the topic of “Immigration on Islands”. 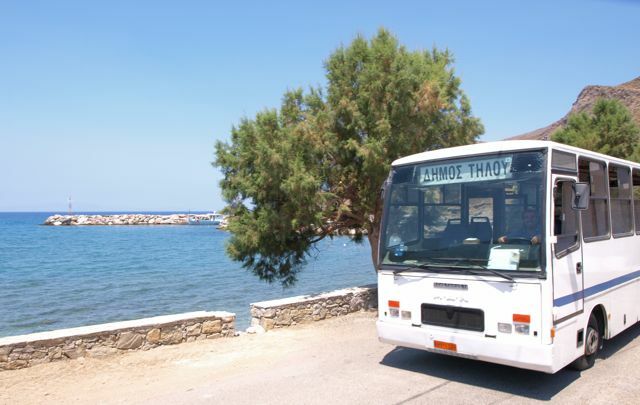 THE ISLAND BUS travels abroad and will screen at the International Festival of Island Film on the Isle du Groix in Port Lay followed by a round table discussion organized and in partnership with Amnesty International and “Non-lieux de l’exil”. Mark the date in your diary and meet us on the Isle du Groix! 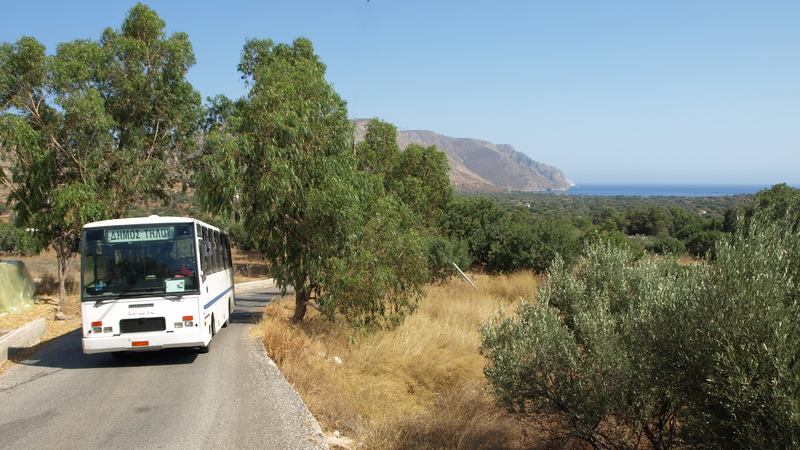 Out of 347 film submissions, THE ISLAND BUS was selected to screen in competition at this year’s Aegean Docs festival. In its previous edition, Aegean Docs screened films like the Oscar contender 5 BROKEN CAMERAS, SEARCHING FOR SUGARMAN and I AM BREATHING – which means we feel really honoured to be part of the line-up for 2014. The festival will take place from 20-28 September 2014 on the Greek island of Mytilini/Lesvos. Updates on screening venue, dates and times will be posted as soon as they are available. Καλό ταξίδι to our film and a massive gigantic THANK YOU to the whole team of THE ISLAND BUS for coming on this journey with me. You were great – and now people get to see it! Here is the trailer for the finished feature documentary THE ISLAND BUS, brand-new, sparkly bright and totally waterproof. THE ISLAND BUS – coming soon. ENJOY! 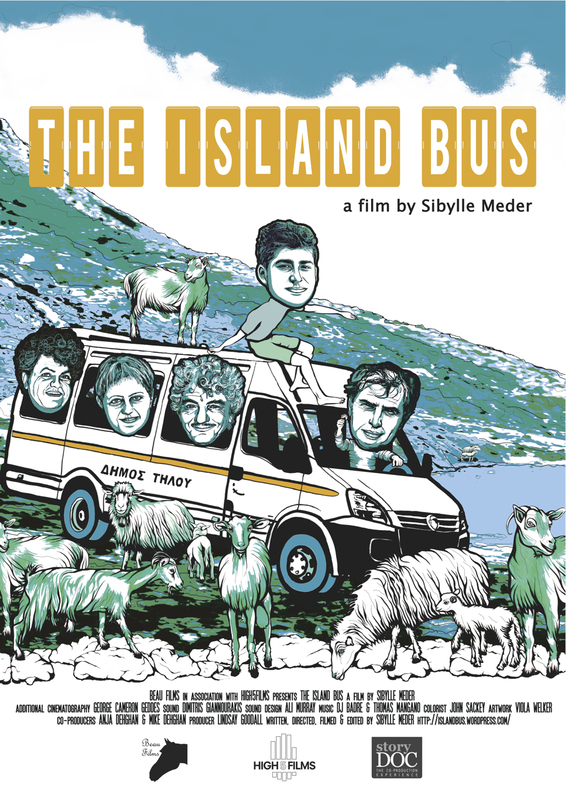 We are happy to let you know that THE ISLAND BUS will be available to watch for industry audience at the KRAKOW FILM MARKET from 26 to 31 May 2014. 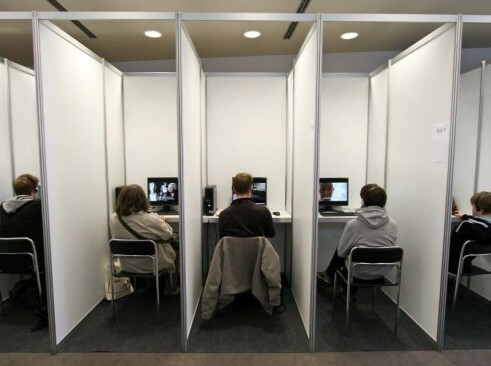 The Krakow Film Market is one of the biggest film markets for documentary and short film in Europe. In the digital video‑library you will have the opportunity to watch around 300 newest titles produced all over the world. About 1000 films, documentaries,short films and animations, were submitted to this year’s edition of the Market, out of which the organizers have chosen around 300 films. All the selected films have been listed in the user‑friendly market catalogue and during the Market they will be available for viewing in the digital video library. 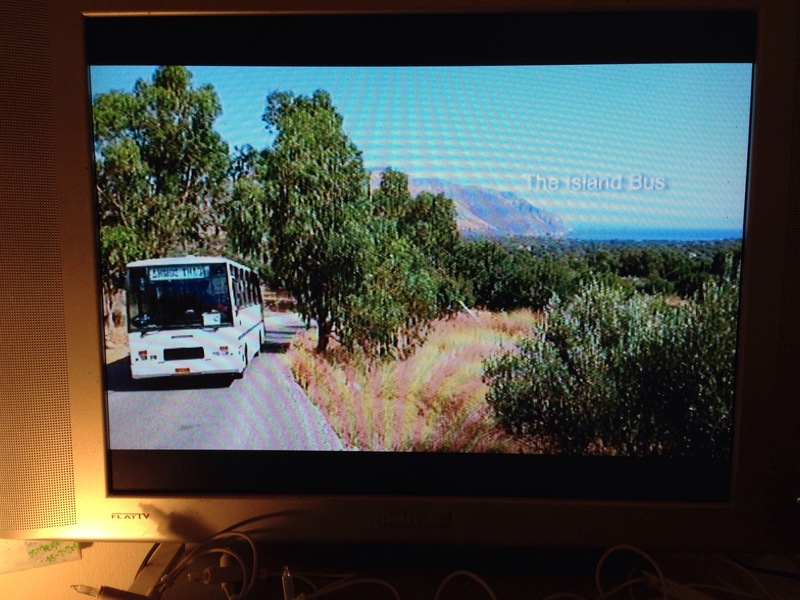 While it was BAFTA night in the UK, I had most of the stars of THE ISLAND BUS over at my humble abode by the Aegean Sea for a super exclusive preview screening of the documentary. It is not that I haven’t watched the 107 minutes of the film quite a few times by now, and to show your work to other people is exciting in any case – but even more so if you watch it in the company of the people who over the past years were generous enough to share a glimpse into their lives with me. And appropriately, like the film and the island life, the screening, too, became a collaborative act: Yours truly provided the venue, the screen and – oh, yes – the screener DVD, catering – including a delicious cake and spoon-sweets – was looked after by Sveta, while for celebrity driving services to and from the venue no one less than Island Bus driver Pavlos got behind the wheel – of his own private car this time. 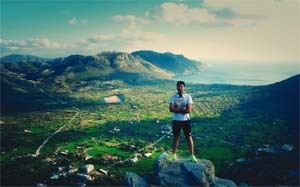 In true fashion, Menelaos had planned to arrive on foot via the Megalo Chorio path but got sabotaged by his son who offered him a lift on his motor bike which had him arrive half an hour early – just in time to oversee feeding the filmmaker’s cats. Your standard cast and crew screening on Tilos, really. A bus on the road on a screen in a house by the road where the bus turns – now say that fast and with a spoonful of plum jam in your mouth! It was a bigger treat than words can describe. Seeing tears well up in Marta’s eyes when the scene with the late and lovely Kyrios Nikolas came up and watching Menelaos and Pavlos nudging each other as they observed their own daily life captured in the documentary, chuckling away at the myriads of little oddities that make life on Tilos – and make a big part of the film – and hearing Sveta laugh at it and repeat “έτσι δεν είναι;” (isn’t it like that?) was a celebration on its own. We toasted with tea and Menelaos’s self-distilled Raki, and I must honestly say I am looking forward to many more screenings of the documentary, but the memory of the roar of the sea at Agios Antonios mixing with the clasping waves on the soundtrack will stay with me for all of them. this was the year 2013 – thanks to you! So here is to a fantastic 2014! Happiness, Health and Fabulousness to all of you! … HAPPY CHRISTMAS AND A WONDERFUL 2014 TO YOU ALL! Happy winter greetings form THE ISLAND BUS hub. To get you into the festive mood in this season of giving, we are giving you an audio glimpse of what THE ISLAND BUS sounds like. Excited? Yes, so are we! The soundtrack is a really intergral part to the film and until you can watch it in combination you will get the chance to listen to some of it here on the blog – with a few stories of how it has come together thrown in for good measure. First in our series of audio snippets is the THE ISLAND BUS title track. Surprisingly enough, it’s called “THE ISLAND BUS” – and appears in two versions in the film. 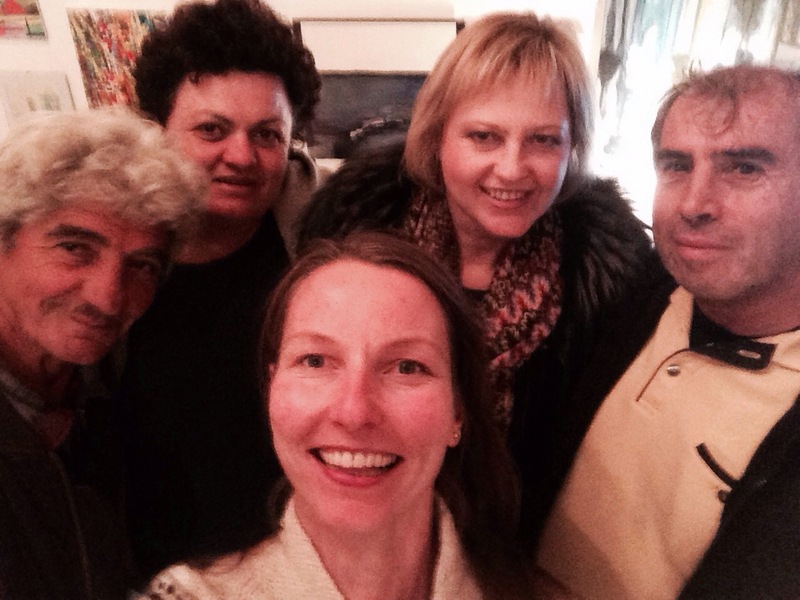 Remember how we set up studio in Livadia and had some of Tilos’s bright young stars – John Bartlam and Dennis Kelly – team up with Tilos’s seasoned live musicians – Pantelis Logothetis, Xenia Logotheti, Antonis and Konstantinos Makris and Aristotelis Hatzifountas? Apart from the perennial classics which old Tilos hands and locals alike know from the panagyris and which you will get to hear later on in the soundtrack, they also got together for a super-laid back jam session or two. 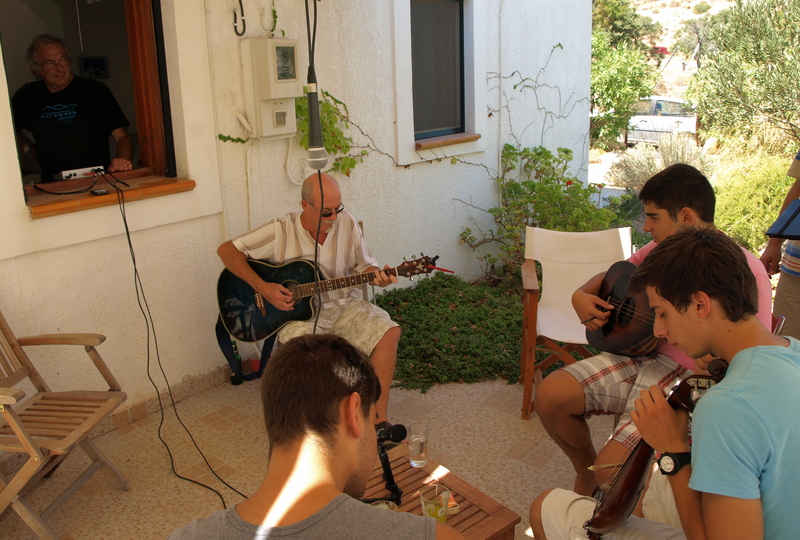 Starting with a guitar tune that John and Dennis had come up with, Antonis, Kostas, Telis, Pantelis and Xenia improvised to their chords – and “THE ISLAND BUS” was created! And in the spirit of “fusion” – which was the piece’s original title – I mentioned to a friend in Dortmund, Germany, that I was looking for a DJ with an interest in Balkan and Middle-Eastern music to remix some of our score. She knew exactly the right person to talk to. 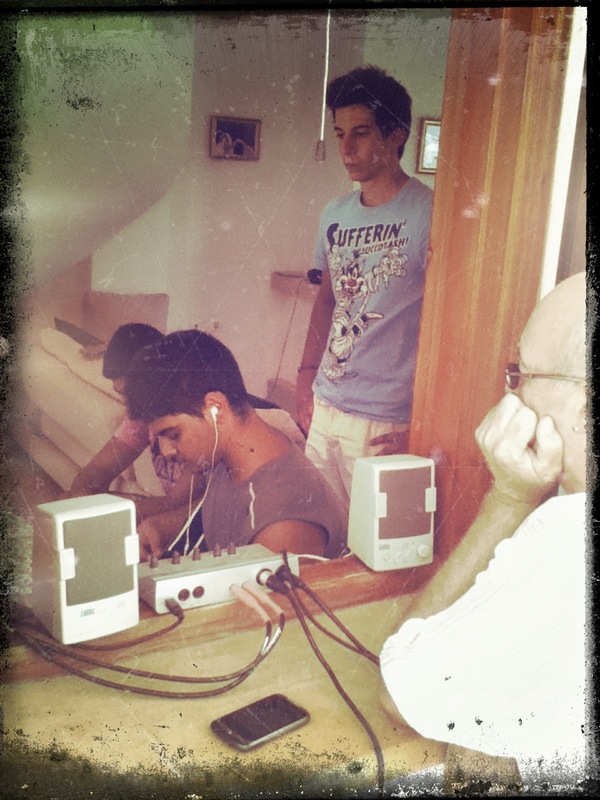 So I took the tune to one of the two wonderful artists responsible for THE ISLAND BUS’s original soundtrack: DJ Badre. 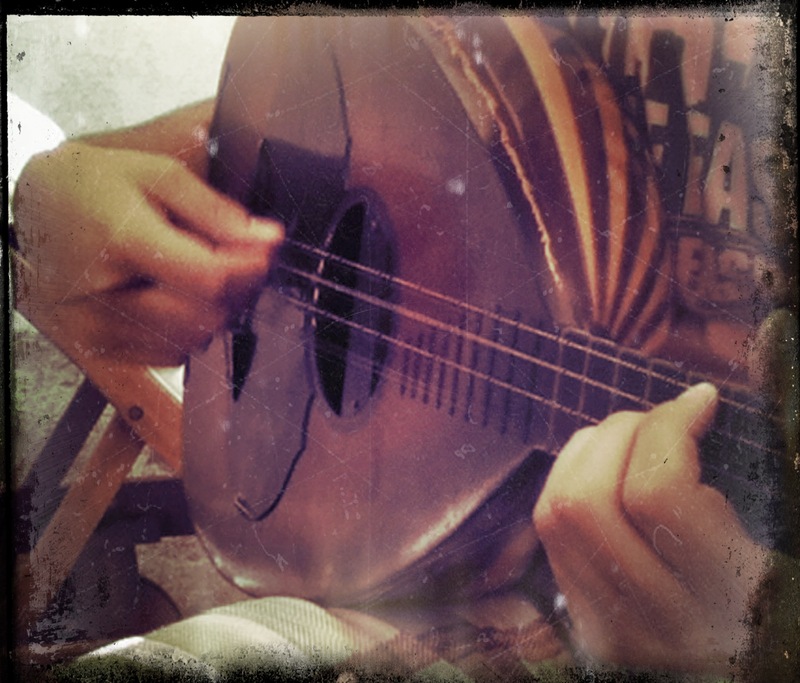 Because of his upbringing in Morocco, Badre was influenced by a huge range of various “ethnic beats and sound”. He was fascinated by this spiritual colourful music and started to create his own, very individual way of combining electrical sounds with ethnic beats. I felt a bit like a child on Christmas Eve – hence the timing – when we first got together to play around – literally – with some of the songs from Tilos. You will get to hear more of his fantastic remixes and also Thomas Mangano’s brilliant original music for THE ISLAND BUS in future posts. Ópa and ho ho ho! Very happy to tell you that we got German painter and illustrator Viola Welker (www.viola-welker.de) on board THE ISLAND BUS team to design our poster. The central theme of Viola Welker’s work is the creature, a created being that can be human, animal, plant or mythical creature. These creatures are in a process of growing and completely at one with their surroundings which vary greatly in form and shape. Floral ornaments and organic cell formations are metaphors for the growing, fading and re-born life of the individual. Her work has been published by Gestalten-Verlag, zeixs-Verlag, 3×3 magazine, Hermann-Schmidt-Verlag and mitp-Verlag. …And we are proud to say: on our poster, too!